There are no coincidences. As a pattern unfolds it sets up force fields that draw into the pattern farflung or hidden pieces that need to be a part. That’s what happened when we began looking at the Buzzerd family photos. I had gone through the albums and loose photos that Linda and Warren Buzzerd uncovered. I was brining them to show Betty Lou. Independently, or not, she had a file folder of SS Buzzerd’s As I Recall columns written circa 1949-51. We looked through the photos. Betty Lou was able to identify a number of people including – Pearl Buck at lunch at the Park View Inn after a visit to the Berkeley Springs Library. 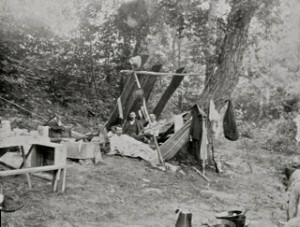 There were several photos of camping excursions along the Cacapon River. A historians dream, they were labeled, dated and the people identified. Usually a group of young men, in one, a collapsed hammock was visible. Another series was a photo shoot at Buzzerd’s Morgan Messenger at about the time he was writing the columns. 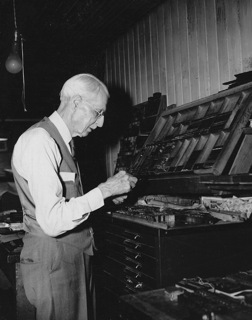 They are wonderful photos, sharp and clear showing SS at the linotype, setting type, and at the typewriter. Perhaps the first time I ever went on a week’s camping and fishing vacation was some 50 years ago. The party was made up of brother Charley, cousin Henry Fisk, Johnny Casler, Irvin Dawson and myself. We pitched camp at the Ziler springs where the pure, cold mountain water empties into Cacapon Creek just below where the Club House now stands. We had no tent so for a shelter, we carried boards from what was at one time a sawmill nearby. The hastily built shelter, being poorly constructed and with the weight of hammocks in which we tried to sleep, fell down on us early one morning. Fortunately, no one was hurt; also fortunately it did not rain while we were there. Most fortunately…they had a camera with them. The makeshift shelter collapsed taking down the hammocks.